The Big Idea: Parenting isn’t easy, and it can feel lonely. Remind yourself that when it comes to family, you can all be there for each other. 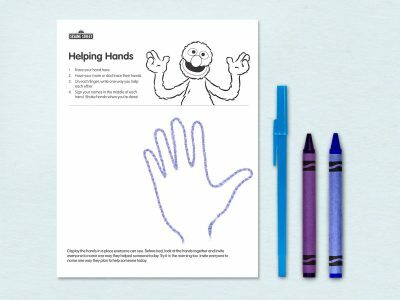 Print this page and work together to create helping hands. Display the hands in a place everyone can see. Before bed, look at the hands together and invite everyone to name one way they helped someone today. Try it in the morning too: invite everyone to name one way they plan to help someone today.